Find information about Albuquerque's right-of-way and construction activities. 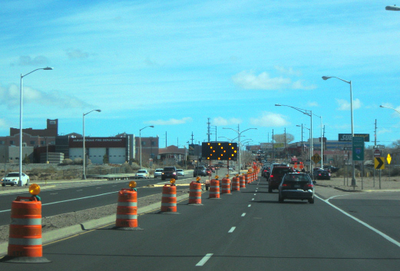 Although construction keeps Albuquerque maintained, it can interfere with daily plans and activities. To help ease your commute, we offer many ways to learn about City construction activities. This regularly-updated street map shows current permitted construction within City jurisdiction. * Clicking on an activity line will display the activity's description, location, date range, and responsible contractor. *Please note this map may not include emergency activities such water, sewer, or gas line leaks. Construction dates are also subject to change due to unforeseen circumstances. *This map does not reflect closures on streets owned and maintained by private facilities, Bernalillo County, or the New Mexico Department of Transportation (NMDOT). For more information, or if you have concerns about a construction activity, please call 311 locally, or (505)-924-3400. You can also visit the New Mexico Department of Transportation for road advisories, road conditions, and a list of construction projects.